"A very simple and tasty recipe!" Mix water and cream of tartar in a large bowl. Stir potatoes into water mixture until potatoes are well coated; drain. Layer potatoes and onion in a slow cooker; season with salt and black pepper. Heat milk and flour in a saucepan over medium heat, stirring often, until boiling, about 5 minutes; season with salt and black pepper. Pour about half the milk sauce over the potato mixture. Scatter Cheddar cheese and ham into the slow cooker; cover with remaining milk sauce. Cook on Low setting for 9 to 10 hours or on High for 4 1/2 to 5 hours. 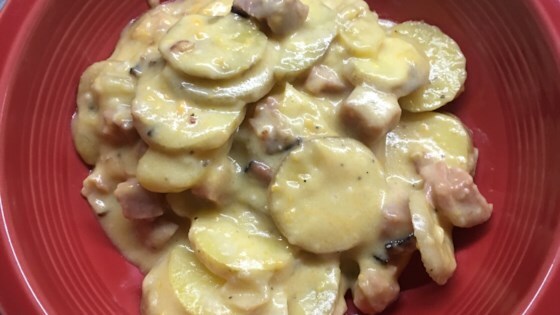 Potatoes, Cheddar cheese, and ham simmer slowly in a creamy sauce. Try using a Reynolds® slow cooker liner in your slow cooker for easier cleanup. Made this for dinner. It was very hearty - comfort food is a great description for it. It could almost be served as a breakfast item. Yum! I added garlic salt since that's a favorite in my house. The potatoes cooked up just right.